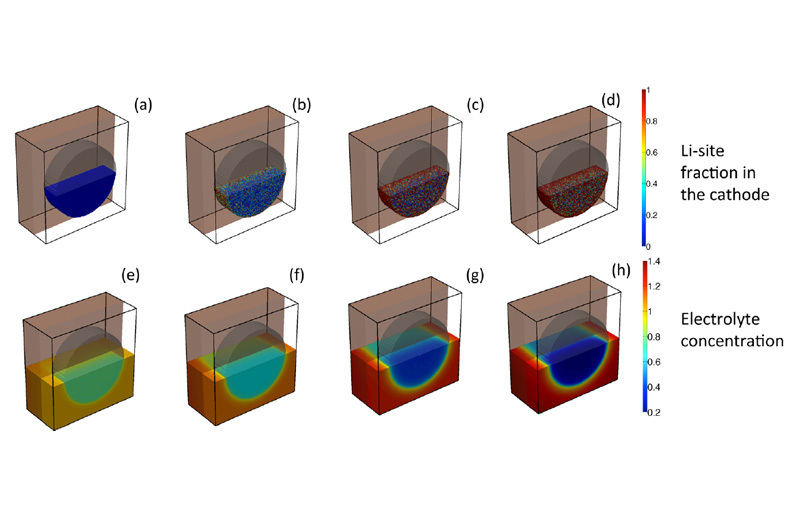 These representations of lithium discharge simulations show the uneven distribution of lithium in the active material within the electrode at different extents of discharge during the first cycle. The top images focus on how much lithium is contained in possible holding sites, with blue indicating full sites and red indicating depleted sites. The bottom focuses on the electrolyte concentration, which is a source of free lithium ions to conduct the battery charging. Each image shows a different stage of the battery's discharge cycle, from left to right, (a,e) 7 percent; (b,f) 24 percent; (c,g) 47 percent; and (d,h) 63 percent (that is, there is more lithium in active material from left to right). Everyone wants better batteries: more energy, more power, longer lifetime, all at a lower cost. But fulfilling all these goals in one product is challenging, so battery technology usually requires compromises. For example, making a battery able to discharge with greater power usually shortens its lifetime. Several teams at Energy Frontier Research Centers are seeking to minimize these trade-offs. For example, teams led by Fiona Strobridge of the NorthEast Center for Chemical Energy Storage (NECCES) and Alex Kozen of Nanostructures for Electrical Energy Storage (NEES) are using new techniques to study and protect lithium-ion batteries during charge cycles. Knowledge is power. In terms of batteries, knowing how charging and discharging affect the battery material is an important piece to the puzzle of optimization. And where the most change occurs is in the first few cycles. Using X-rays to watch a battery cycle in real time. Strobridge and others from the NECCES studied intact coin cells to dissect the charging and discharging processes in these important first cycles. They used a lithium-based candidate, LiFePO4, as the active material in the positive electrode in a coin cell battery. LiFePO4 is capable of accepting and donating lithium ions from its crystal framework, which is essential to storing and dispensing energy in rechargeable lithium-ion batteries. To examine the material, Strobridge and the team used energy dispersive X-ray diffraction (EDXRD), which relies on using many different wavelengths of high-energy light to probe materials. The X-rays penetrate the steel casing of the coin cell, allowing the team to monitor lithium content in and through the electrode while cycling their batteries, which can be a challenging setup for obtaining reliable data. With this technique, they mapped the electrode at different depths during the charge/discharge process through the first and second cycles. They then used the data to construct computer simulations to further study the results. They revealed two important phenomena: 1) charging was not "even" across the electrode or through the electrode and 2) two different mechanisms affected the electrode’s charging in the second cycle versus the first cycle. During the first cycle, Strobridge and the team inferred that the diffusivity of lithium ions; that is, the ion’s ability to move through a medium, was the main limiting factor in the uneven charging in the electrode. They used computer modeling of an identical setup to test this hypothesis, relying on lithium-ion diffusivity as the limiting factor, and found that the simulations agreed well with observations from their experiments. However, in the second cycle, they found uneven charging had occurred through and across the LiFePO4 electrode. The EDXRD patterns revealed a distinct change from first to second cycle, which suggested that it was caused by a decrease in the electrode’s electrical conductivity, its ability to pass electrons. When they decreased the electronic conductivity of the LiFePO4 electrode by a significant factor in the simulations, the models matched their observations. This validated their approach and gave them the confidence to apply their models to predictive purposes. The results of their models for future electrode design suggest higher porosity and some variance in particle size to encourage uniform charging of the material, which would lead to better stability and performance. Their research highlights the challenge of charge uniformity in developing electrodes, provides a theoretical means to explain and predict how batteries function, and suggests a way to overcome the challenge. The challenge of achieving charge uniformity in battery material has also suggested more exotic solutions, such as using a 3D electrode design. Electrode patterning would allow for better ion access at more points in the 3D electrode, which could shorten charge times and increase potential power output to a higher degree than would be possible in traditional 2D designs. However, as the team from NECCES observed, charging a battery alters the material it uses to store energy; the faster the charging, the faster the battery material will change, losing efficiency and power, and eventually leading to breakdown, a process called degradation. Protecting batteries by a layered defense. A common solution to the degradation conundrum is to employ materials called solid electrolytes as protective coatings on the battery electrodes. Solid electrolytes allow lithium ions to pass through them via ion transport pathways in their structure. However, they are able to prevent electrons from passing through, protecting the electrode from harmful degradation, and improving stability and overall battery performance. But the trade-off for the battery is slower charge time, depending on the rate at which ions can move through the material. So, for a battery, scientists want to use the best solid electrolyte available. LiPON, a glass composed of lithium, phosphorus, oxygen, and nitrogen, is one of the best solid electrolytes, boasting conductivities thousands of times better than the competitors. However, almost all techniques for applying LiPON require a 2D, or planar, electrode design. Kozen and the team at NEES sought to employ a different technique that would overcome this limitation for LiPON: atomic layer deposition (ALD). ALD can deposit atoms and molecules uniformly on any kind of surface, 3D or otherwise. ALD is similar to laying down a new layer of pavement. Just as the different layers of materials, gravel, binder, and asphalt, go into making the desired pavement, different layers of gaseous molecules, called precursors, are layered to produce the desired materials. Kozen and his team perfected a process for coating materials in LiPON by this method and even demonstrated the ability to control the nitrogen content in the material, which has a direct impact on its ability to transport lithium ions. Most important, they confirmed their ALD-made LiPON had conductivities comparable to standard methods of synthesis. Further, they were able to tune the LiPON’s thickness with nanometer precision, demonstrating incredible control over the process. Conclusion. Both of these teams demonstrate through their new techniques the cutting edge in researching battery mechanisms and protection countermeasures. Their developments contribute added insight and further ideas for the energy storage community and the ultimate goal of battery design that is faster, smarter, and stronger. Kozen et al. This work was supported as part of the Nanostructures for Electrical Energy Storage (NEES), an Energy Frontier Research Center funded by the U.S. Department of Energy (DOE), Office of Science, Basic Energy Sciences. We acknowledge the support of the Maryland Nanocenter and its NispLab. Strobridge et al. The Engineering Physical Science Research Council provided a Doctoral Training Account Award (for FCS) and the DOE, Office of Science, Basic Energy Sciences provided support via the NECCES, an Energy Frontier Research Center. FCS acknowledges the Science and Technology Facilities Council for travel funding through the Global Challenge Network in Batteries and Electrochemical Energy Devices. Synchrotron X-ray beamtime was provided by Diamond Light Source. Timothy Plett is a Ph.D. candidate in the Physics and Astronomy Department at the University of Irvine, California. He is a member of the Nanostructures for Electrical Energy Storage Energy Frontier Research Center and serves as student coordinator for Thrust 1, which focuses on nano-interface research. His emphasis is biophysics, but specific research has been directed at understanding solution behavior in nano-confinement: nanopore rectification and cation dependence, ionic conductivity in manganese dioxide rods, solid electrolytes, and non-aqueous salt solutions.